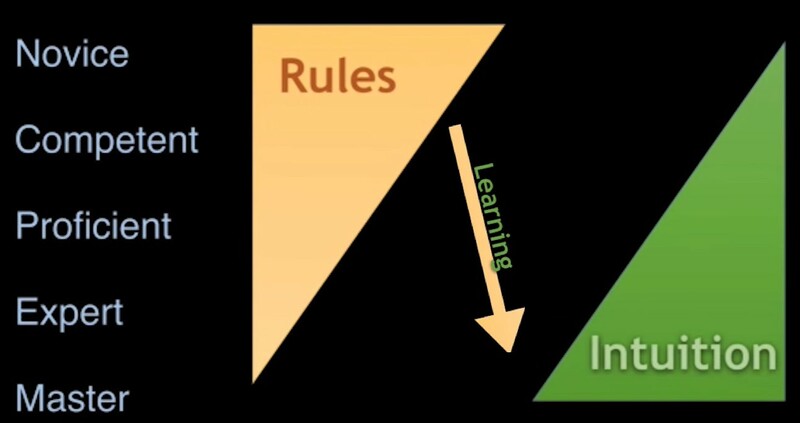 So, Novice humans first learn some rules to become Competent and then Proficient, but to become Experts and even Masters humans are “forgetting” the rules transforming them to Intuition or Tacit Knowledge. These hidden rules become assumed and instead of being explicitly formulated are hidden in an “implicit rules repository” somewhere in human brains. The classic test of whether knowledge is tacit or explicit is this: If you lose the person, do you lose the knowledge? Clearly, you want basic business know-how to be explicit. Experts know things without knowing exactly how or why they know them. Just one example from my past experience. That time we implemented a system that was able to find optimal diameters for gas pipelines based on streams, required pressures, corrosion levels, etc. Over the years our program became highly efficient saving a lot of metal and unnecessary investments. At the same time we had old subject matter experts who always were able to improve the results produced by our program. They were able to manually assign some diameters and after automatic recalculation, we usually saw an additional saving. We knew that these experts used to do all calculations manually and we wanted to automate their unique knowledge. However, while they were able to explain why they made their decisions for every particular case, it was impossible for them to generalize the rules they used of doing that. No Rules are Universal. All Rules need Context. For a particular decision model, the context can be described as all feasible combinations of values for all considered decision variables. While the DMN standard and other decision modeling approaches recommend the decision model to cover all possible combinations, it is not practical to come up with business rules that can do it even for relatively small decision models with 20 variables and tens to hundreds values. So, what can be done? One approach, called Predictive Analytics, is an automatic generation of business rules based on historical data with known results. It is especially promising when you put your rules generation and execution engines in the ever-learning loop as was defined by Tom Mitchel a while ago. Another approach, called now-days Prescriptive Analytics, utilizes Constraint and Linear Programming: see for example my recent Linkedin’s post that offers an interactive what-if analysis of decision models letting a human modeler to define only major business rules without covering all possible variable combinations, and forcing a decision engine to find an optimal solution by minimizing or maximizing a certain business objective. Building decision models and trying to explicitly define ALL business rules, we are moving from Tacit Knowledge to Rules, that at the best may put our target decision model at the Proficient level. At the same time, when a human initially learns how to do things by rules and achieves the Proficient level, s/he is trying to move from Rules to Tacit Knowledge to reach Expert/Master levels. This difference points us to a not very optimistic conclusion: in spite of a good progress at the Proficient level, the modern decision modeling approaches do not even try to reach an Expert (not mentioning Master) level that will probably require completely different knowledge representation techniques. This is a great post, Jacob! And the topic is worth to further explore. My initial questions is how those levels (Expert, Master etc) are measured.